There’s a new version of AnyColor up on addons.mozilla.org that “works” with Firefox 3.6. It works, yes, but it already has some visual bugs that I’m aware of, like the top part of the “Add-ons” window (it looks like the Firefox developers changed something, again). I will not be fixing these bugs in the foreseeable future and AnyColor won’t be as good as it used to be, which is why this new version is marked as “experimental”. What this means is that Firefox will no longer offer automatic updates for it – you have to go on the addons site, click that checkbox that says “Let me install this experimental add-on” and have it installed. By the way, which browser do you think looks better? Firefox 3.6 (with personas built-in) or Google Chrome (minimal user interface and bitmap themes)? Yep, that’s it. I’ve been staring at this editor for 25 minutes thinking of what should I say and what not but the bottom line is this: I will no longer support, improve or update AnyColor. There are various reasons that led to this; the most important ones being time constraints, lack of motivation, disappointment at Mozilla and the existence of an alternative (Personas) that users can switch to. AnyColor will not be compatible with Firefox 3.6 which (unless I’m mistaken) is scheduled to be released in December. Please uninstall AnyColor and install Personas. Use this link to request features and give feedback about Personas. AnyColor has had a great run, reaching millions of downloads and peaking at about one million daily users. This is where one would usually say that this level of success was unexpected but the truth is, it wasn’t. 🙂 I’m just glad people liked it. P.S. I will personally keep using it until it breaks apart and I may release an update or two until then. Version 0.3.0 has been uploaded to AMO and the automatic update should be available as soon as the new version is reviewed. There are several new features and fixes in this version, the most prominent being the ability to use “personas” and the export/import functionality. Personas is an add-on very similar to AnyColor, by Mozilla Labs. It doesn’t have as many features as AnyColor; it can set a header & footer image on the main window but it can’t change colors, it doesn’t “skin” the menus, the scrollbars or any other window and has no “tweaks”. Personas, however, has a great “Gallery” with a lot of excellent themes. Instead of duplicating it, I made AnyColor able to use the Personas gallery and it so far seems to be great. I’ve also added a drop down menu item to the AnyColor toolbar button that let’s you select a “persona” the same way you select a preset. Most Personas themes look great but you may find that you don’t like the text color or the background color. No worries, you can apply a “persona”, open AnyColor’s options and change the colors until you’re happy. Don’t forget to save your customized appearance settings as a preset (by going to the Presets tab and clicking “New”). The new Import/Export functionality should be straightforward. Just open the options window and go to the presets tab. Clicking the new “Export” button will prompt you for a filename to export the presets to, while import will ask you to select a previously exported file. For those interested, the presets are exported in JSON format. There have been a few reports that AnyColor changes the background color of the email composer on some web mail providers, like Live Mail (Hotmail) and Google Mail. The problem is especially noticable when you use a dark preset because the compose window turns dark. As it turns out, the composer window is actually an empty tab window (about:blank) in an invisible frame so when you select a dark background, it affects that empty tab too. I’ve added a fix for Live Mail but I wasn’t able to reproduce it on Google Mail. I also added a new tweak called “White blank windows”. 🙂 You can open the advanced options panel and add it if you like, it will make all empty tabs white and should fix the colors of the mail composer windows. The translucent Firefox window border seen in a screenshot on AMO is, unfortunately, part of the operating system (Windows Vista – Aero). Firefox and AnyColor isn’t able to style that part of the window, that’s painted by the OS. About Linux and Mac compatibility: Firefox uses different CSS files (styling) for each operating system so supporting them needs a lot of work and maintintaing them will take a lot of time. I love Linux and I have several PCs running it so I plan to support it when I can. Not so sure about Macs – I don’t own and I don’t plan on getting one anytime soon so I simply can’t develop AnyColor for it. Similarly with Linux support is the Thunderbird version. I use Thunderbird exclusively and I love it, it just takes a lot of time to rewrite all the CSS style rules. AnyColor can now automatically import & use “Personas”, either from the gallery or directly from the AnyColor toolbar button. The start page (welcome page) will now open when the add-on is updated to a new version. You can now reset all presets to their default state. You can find the button on the presets tab on the options window. Added a “donate” button on the start page for those that would like to support this add-on. Made menu items slightly taller. Fixed a small appearance artifact (CSS) on second level menus. Fixed the text color of the search suggestions when using a header image. Styled the “sanitize dialog” from Firefox 3.5. Compatibility update for changes introduced in getParemeterIndex() on Minefield, platform version 1.9.2. Let’s hope it doesn’t change again. Fixed the selected text color on some web pages’ text areas. Compatibility update for Live Mail compose window. Added the “white blank windows” tweak that sets all about:blank windows to black on white. Version 0.2.6 had several minor fixes. Small fixes for compatibility with 3.6a1pre. Small compatibility fix for DownThemAll!. Removed the “Hide main menu” tweak. Fixed a bug that would cause the “Get more presets” link to stop working. Added the “Lighter Menus” tweak, it makes the menu popups lighter than the regular background color. Removed built-in color overrides for Fast Dial and added it as a tweak. Fixed the flickr preset by correcting the invalid json response. Added the “Lighter radio and check boxes” tweak. Added Hungarian translation by Mikes Kaszmán István. By the way, here’s a Firefox tip for advanced users: There’s a hidden setting in Firefox that makes all preferences be applied instantly, without you having to click the “OK” button. AnyColor respects that setting and hides the “preview” button – when you change a setting, it gets applied right away. To enable this hidden setting (it’s on by default on Linux): Type “about:config” in the location bar and skip the warning. A page with a lot of options will appear. Type “instant” in the search box and you will see a preference named “browser.preferences.instantApply”. Double click on it and it will change from “false” to “true”. That’s it. This tweak will hide the main menu. Take care if you enable this tweak, you may not be able to disable it without the main menu. If this happens, open the page “about:config” and type “extensions.anycolor.activeCssFragments” in the “Filter” box. Right click the configuration entry and click “Reset”. This issue will be fixed in the next version, either by removing the tweak or by displaying a warning. AnyColor has been made public on addons.mozilla.org and it’s seeing a lot of downloads! Going back, I remember starting AnyColor’s development just because I wanted a dark theme that I like. I had to rewrite the master CSS file 3 times, adding features, changing many rules to make them use the new rgba() and hsla() color values and many more changes until I was happy with it. I remember my disappointment when mozilla changed the CSS for Gnu-linux & Macs significantly and I was forced to mark AnyColor as Windows only. Today I use it on all of my PCs and I’m glad I can share it with others that find it useful. Fixed a compatibility issue with several other extensions. Added a “square everything” tweak. Moved the “More Presets” page to a new host and added a mirror as well. I was informed that there’s a small bug that I haven’t fixed yet; if you open the AnyColor options window from the addons list, the ‘Get more presets…” links don’t work. It will be fixed in the next version. I’ve just uploaded a new version. You can find it on AMO or if you don’t want to login, here. 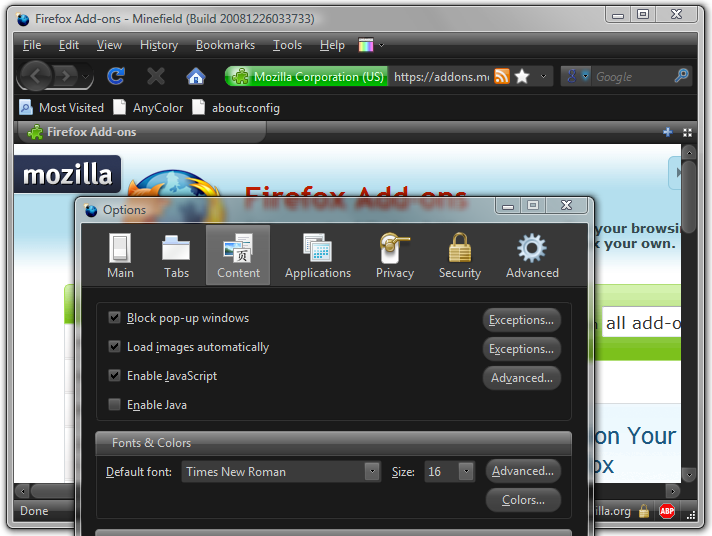 Few changes this time, the most important being the compatibility with Firefox 3.1 beta 1 and beta2 pre. It wasn’t just a version bump, unfortunately. The JSON parser that is built into Firefox has changed, causing any theme library related function to fail (list presets, load, save, load from the web). I also identified and solved a second issue related to the custom colorpicker widget used in AnyColor and Firefox’s preference system, but only when “instantApply” was turned on. I’ve no idea what’s changed in the new Fx versions but I worked around the problem. Improved compatibility with the Chatzilla add-on, made AnyColor respect the tab status and coloring (requested by Jake). Changed the appearance of the selected (hover) menu items. The old style (inverted fg & bg) has been added as a theme tweak in case someone really likes it. Marked the following “icon-pack” themes as compatible with AnyColor: Azerty III, Qute, CrystalFox Qute.